Why waste your time chasing after prospects when you can get them to come to you? Most self-proclaimed rainmakers let business drizzle in rather than positioning themselves to experience a downpour. 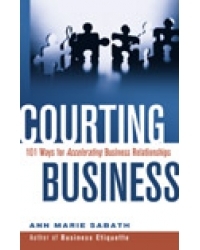 Courting Business: 101 Ways for Accelerating Business Relationships gives you the strategies for getting prospects to contact you. Ann Marie Sabath’s proven three-step strategy will inspire you to be creative, consistent,and politely relentless in a way that will please even the toughest prospects. This hands-on guide offers tips and techniques for successfully attracting and closing business. Best of all,it will fan the flame of business relationships and put the passion back into your professional life. • See why if you&apos;re on time, you&apos;re late! Whether you are a novice or a seasoned rainmaker, Courting Business gives you a foolproof system for outclassing your competition and getting prospects to say that wonderful word, "yes!" Ann Marie Sabath&apos;s business development concepts have been recognized by USA Today, The Wall Street Journal, Forbes, Inc. magazine, CNN, CNBC, 20/20, and Oprah, among hundreds of other electronic media. During the past 18 years, she has assisted more than 100,000 individuals representing law firms, accounting firms, engineering and consulting firms, and sales teams in outclassing their competition. Anne Marie has authored six other books, including Business Etiquette (Career Press).